It seems there is never any rest for Milan fans. And no, I am not just talking about the injuries to key players this season. Over the years, Milan vice-president Adriano Galliani has boasted of the "family" atmosphere at Milan, which would, inevitably of course, preclude any Milan player to yearn for a new, sometimes more lucrative beginning at another club. Even as late as 2006, this official line was somewhat tenable. During that year, Andriy Shevchenko left for Chelsea for thirty million sterling. The departure of Milan's star player at the time was bizarrely accounted for as a "triumph of the English language" by Galliani, referring to Shevchenko's desire to learn the language, so that he could communicate with his American wife Kristen Pazik. Clearly, any linguistic shortcomings had not spoiled any nuptials, as both speak Italian, but fans were expected to believe the somewhat ludicrous official line. Nevertheless, Milan fans rationalized Shevchenko's departure as great business for the club. He was turning thirty that year, and had spent his best years at Milan. As painful as his departure was, Milan still had Kaka. Or did they? The summer of 2006 unearthed the depraved machinations of calciopoli, and in anticipation of the punishments, European giants began to ready their shopping lists. Indeed, Fabio Capello, who left Juventus that year for Real Madrid, openly, and callously, suggested that everyone was hoping that the big Italian clubs would drop down to the musty dwelling of Serie B (and potentially even lower in the case of Juventus). He wouldn't see his sadistic wish granted completely. Juventus certainly did go down to Serie B, and Real Madrid snapped up Fabio Cannavaro, gilded and glowing from a staggering World Cup triumph, and Emerson (I'll forgive you if you forgot about him). Milan stayed up with a points' penalty, and Kaka stayed on after a contract renewal. But a chasm had appeared: Milan, for the first time, looked somewhat shaken in their confidence of being able to hold on to a star player. Real Madrid's president at the time, Roman Calderon, complete with vampiric good looks and a vulture's charm, had enraged Galliani with unscrupulous methods of trying to entice Kaka to leave. Calderon had once said that he would not want his tombstone to read, "Here lies the president who didn't sign Kaka." He tried everything in (and perhaps somethings oustide) the book to get Kaka to come to Madrid. It took until 2009, but it finally happened. Though, much to the detriment of Calderon's already tarnished image, the man who made it happen was Florentino Perez, someone who had warmer relations with Galliani. Unless Calderon makes a resurgent return to the presidency, which is about as likely as the Gaddafis returning to power in Libya, he may have to resign himself to his dreaded epitaph. Tellingly, Milan's excuse for the Kaka sale was neither comical, nor implausible. "We have to balance our books," Galliani said after selling Kaka to Real Madrid for about sixty-eight million euros. "We can't keep depriving ourselves of this amount of money." And there it was--an ugly, pragmatic reason of money. Suddenly, the family values rhetoric seemed tenuous. Milan had misgivings that most clubs, even the big ones, have, and even the vanity of owner Silvio Berlusconi wouldn't allow for such an extravagant luxury of simply keeping Kaka. The transfer of Shevchenko and Kaka will never permit any Milan fans to categorically dismiss any speculation surrounding their players. And the latest speculation, which chastens even now in the crisp month of October, months away from the summer, is around Milan's best central defender, and some say the world's, Thiago Silva. Barcelona's interest in the defender is genuine and promises to be relentless, and, for his part, Thiago Silva has done little to assure fans of his fealty to Milan. "Adriano Galliani and my agent deal with my contract," Thiago Silva said recently in an evasively succinct response to the 'Barcelona question,' which will undoubtedly loom larger and larger with each passing month. His answer, though terse, brings his motives into sharp relief: use the media neither to deny nor confirm intentions. The modern footballer is groomed for precisely this sort of ambiguity, which aims to alienate no one, keeping all options open by absolving oneself of responsibility. This ruse of self-effacement naturally calls on the divine to get in on the public relations work. A popular refrain, repeated by his more devout compatriot Kaka was "only God knows my future." Even Inter's, for how long is anyone's guess, Wesley Sneijder, whose appeals to anything religious were fairly well concealed for most of his career (at least as far as I know), took the same recourse a few months ago when asked about Manchester United's interest. As much as Milan fans will hate to admit it, Thiago Silva wants to play for Barcelona. He also wants to play for Milan. The crux of the issue, however, is how much do Milan want to keep him. An open rebellion on part of the player is not on the cards. Last summer, Thiago Silva admitted talking to Barcelona, but left the rest for Barcelona and Milan to talk over. Milan renewed Thiago Silva's contract until 2016 in May of this year, and therefore had no intention of selling the player. But for how long? All of the Thiago Silva speculation will be going on against the backdrop of Italian football's glaring decay. Galliani has become a prophet of doom and gloom in Italian football, never missing an opportunity to remind any that harbour any sort of optimism in any recesses of their hearts and minds that Italian football is and will remain for the foreseeable future far behind England and Spain--or, that is, the top two of Spain, at least. The simple economics seem to necessitate an eventual transfer. Barcelona certainly make a lot more than Milan do. Yet, even that is only a part of it. At Barcelona, in case you didn't know, they are doing wonderful things, winning titles for fun and winning them with beauty and élan. Just like the burgeoning fleet of newly manufactured Barcelona fans--they swear they know who Cruyff is--join the ranks of the long faithful, players are tripping over themselves to be part of the great football experiment in Catalonia. Yet it won't matter what Thiago Silva says or what Barcelona say or what the pro-Barcelona press says (the latest in that media is the laughable story that Thiago Silva has told friends he is leaving for Barcelona). Instead, it will matter what Galliani says or doesn't say. The man relishes playing the media, but he has been relatively forthcoming when it has come to players' sales. After Milan had beaten Fiorentina to secure automatic Champions League qualification in 2009, he was asked in the post-match interview whether Kaka would be sold to Real Madrid (recall that months earlier Milan had made it clear that their prized asset could indeed be sold by their willingness to deal with Manchester City), and Galliani responded with, "let me rest now, there is a lot for me to deal with." It was a tell-tale response that surprisingly barely registered on the media. At other times, Galliani had been unequivocal, saying in effect that Kaka was untouchable and part of the Milan future. 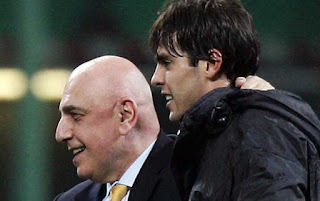 However, if Milan fans had hoped that the failed transfer to Manchester City in January of 2009 had renewed their club's bonds with Kaka, they were to be mistaken, and Galliani's hesitance betrayed the truth. Even though it is not always trustworthy, it is Galliani's language to which we must pay attention over the next few months. Thiago Silva has also already uttered the words that all Milan fans are dreading more than his dithering: "I want to stay at Milan for a long time and be the club captain." Recall that is exactly what Kaka also said in interviews. Of course, Galliani is always in lockstep with club owner Berlusconi, and the latter's commitment to Milan is no longer quixotic. Beset by scandal, he is also leading a country in a parlous economic situation. It is sometimes facile to make a simple connection between politics and sport, but in the case of Berlusconi the two have always been intertwined. Many still maintain that Kaka was sacrificed because Berlusconi wanted to show solidarity with a population facing financial hardships. How will Berlusconi contextualize Milan's affairs in the current political realities of the country? Lest things get too depressing, along came Cafu, the perma-grinned former right-back of Milan, to offer his opinion: "Milan won't easily let go of Thiago Silva. It makes sense why Barcelona want a player like Thiago in the center of their defence for many years to come, but I do not see him moving." Barcelona's fervent interest surely does make sense, as Cafu says, even more so after Pato ripped through their makeshift central-defensive pairing of Javier Mascherano and Sergio Busquets at the Camp Nou this season during a Champions League game in September. Barcelona need cover in the center of defence urgently, not least because captain Carles Puyol is now ageing. If I had to make a guess, there is a possibility that Thiago Silva will leave for Barcelona in the summer of 2012, but it is more likely for him to leave in 2013. He will not, in my mind, end his career at Milan. His transfer also depends on how much money Barcelona have and how much they are willing to pay for a central defender (and of course whether or not Barcelona will remain attractive candidates in two years). Remember that it proved difficult for them to sign both Cesc Fabregas and Alexis Sanchez this past summer. Their revenue may be prodigious, but the club does have some debt with which to contend. Milan certainly see Thiago Silva, who just turned twenty-seven this year, as the natural heir to Alessandro Nesta. He is the defender around whom the back-line can be moulded for several years. There are few central defenders in the world who can lay claim to being in the same league as the man from Rio de Janeiro. However, frighteningly for Rossoneri fans, it remains to be seen what kind of pressure Milan's desire to hold onto Thiago Silva can withstand--or, indeed, wants to withstand. I hope that you are wrong, my friend. "Milan, for the first time, looked somewhat shaken in their confidence of being able to hold on to a star player." I think, unfortunately, this is an increasingly common phenomenon for all clubs even the so-called 'big' clubs. The same thing happened to Real Madrid with Makelele and more recently Robinho. There is very little loyalty in football and when a player decides he wants to go, he will go (eventually). Maybe this was not the case with Kaka. It seems that he would have stayed in Milan were the decision completely down to him. If Thiago Silva has made up his mind to play in the Camp Nou then I think the best Milan can do is hold Barcelona's feet to the fire and make them pay an exorbitant price for the player. They have paid €10m, €18m, and €25m for the likes of Henrique, Martin Caceres, and Dmitro Chygrinskiy in recent years. And they are all rubbish. If Galliani is clever he will be able to get sizeable fee for Thiago Silva. Still not entirely sure why Thiago Silva would want to go there. Players not from la Masia have found it extremely difficult to get into Guardiola's XI and that includes gifted players like Yaya Toure, Zlatan Ibramimovic, and David Villa. Really the only signing that has fit into the team is Mascherano and I think if the truth is known that is really because Pep actually dreams of eventually playing a 1-9-1 formation. In any case, I hope you keep him. I agree to an extent Jaime. I think given how Italian football is struggling currently, it is more likely for players to leave Milan or Juventus than Real Madrid or Barcelona. The Spanish clubs seem to be THE destination for players to go to. Even if playing for a club like Milan is a huge honour, Milan do play in the context of Italian football, which is struggling currently. Sure, Spanish football is struggling outside the Big Two, but players will almost always take the chance to play for Real Madrid or Barcelona. I really hope Thiago Silva stays beyond 2013, but if he does go, I agree that Milan should ask for a huge amount.